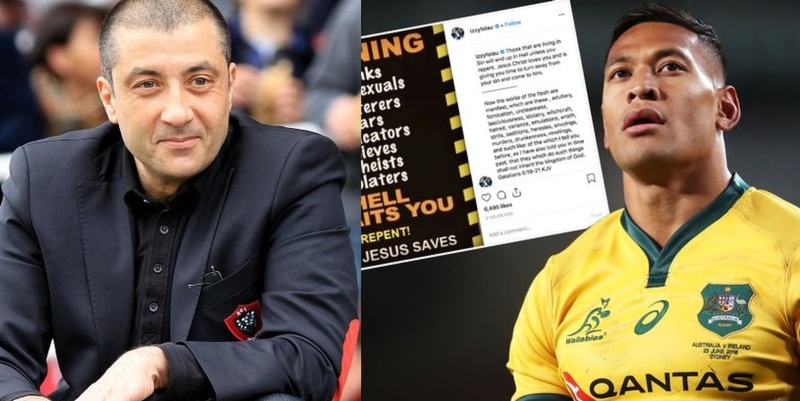 Toulon owner Mourad Boudjellal has labelled Israel Folau “a moron”, ultimately ending any rumours of the controversial Wallabies star could head to the French club. Freeing himself of his four-year Wallaby contract would leave him available to snare a bigger payday in Europe or see him code switch once again. The NRL ruled out a return to the game with one of the executives stating that there is no place for him in the league. Boudjellal was asked about Folau in a wide-ranging interview with L’Equipe on Thursday. The wealthy club owner didn’t hold back. “The guy is a moron, he must leave. Or you have to buy a brain,” Boudjellal said. He also made a reference to the Ku Klux Klan and Folau “seeing how it feels to be on the other side”. Australian Rugby League chairman Peter Beattie made it clear the former Melbourne and Broncos star would have to continue his career elsewhere. “Israel Folau doesn’t pass our inclusiveness culture, which is a policy strongly supported by the ARLC,” Beattie said.